An advance copy recently came my way of Ernst Weiss’ 1931 novel (in a new translation by Joel Rotenberg). 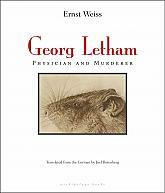 Georg Letham: Physician and Murderer, due out at the end of the year from Archipelago Books. It is a massive (560 pages) novel that ranges from ships lodged in polar ice to equatorial villages. The novel has some unforgettable scenes, many of them involve rats, which are a main motif of the novel. Told in first person from the point of view of the title character, we get a sense of his upbringing, the hard lessons his embittered father taught him, and Georg Letham Jr.’s learned disavowal of love. Mankind, according to his father, shouldn’t be classified as good or evil, or successful or unsuccessful, but rather he “asked me quite casually whether people might perhaps be classified as frogs or–rats.” What follows is a series of chilling summings-up of others Letham meets, their classification as frog or rat, always an animal on which one routinely does experiments, vivisections–never a man. On the whole, the novel is good. Rotenberg’s translation is fluid and shows a sensitivity to sound (‘with a cannonlike crack an incandescent flame shoots out of the dense, slate-colored cloud of smoke”). In my opinion Weiss’ manuscript would have benefited from a stronger editorial presence back in 1931, lost 100 or so pages and gained a sharper focus. At times, Georg Letham threatens to approach the bitter vindictiveness of Dostoevsky’s Underground Man, but shies away at the crucial moments. This is good, in a way, in that it gives us a sense that redemption is possible in the man; something we don’t get in Dostoevsky’s bitter short novel.